An analysis of the diet and lifestyle of 35,000 adults who scored their diets from 0-5 to see if they met a bare minimum of healthy-eating targets — which included fruit, vegetables and whole grains, found that only 1% achieved a 4 or 5 in dietary requirements. Eating more healthily (this is defined as consuming more fruits, vegetables and whole grains and less meat). These four factors alone were found to account for more than three quarters of the risk of developing a chronic disease. By following these four recommendations an individual is able to reduce by 90% the risk of developing diabetes, 80% risk of having a heart attack, 50% risk of having a stroke and the risk of developing cancer by 33%. Indeed, one study has shown that the drop in mortality risk among those with healthier habits is equivalent to being 14 years younger! In each of our cells, we have 46 strands of DNA coiled into chromosomes. At the tip of each chromosome, there’s a tiny cap called a telomere, which keeps DNA from unravelling and fraying. Every time the cells divide, a bit of that cap is lost. And when the telomere is completely gone, cells can die. Researchers discovered an important enzyme found in an ancient tree — a bristlecone pine that grows in the White Mountains of California and is nearly 4,800 years old. This enzyme in the pines’ roots appears to peak a few thousand years into the trees life span, and it actually rebuilds telomeres of the trees cells. Scientists named it telomerase. Once they knew what to look for, the pioneering Australian-American researcher Dr Elizabeth Blackburn and her team discovered telomerase in human cells as well. She was awarded the 2009 Nobel Prize in Medicine for this discovery. 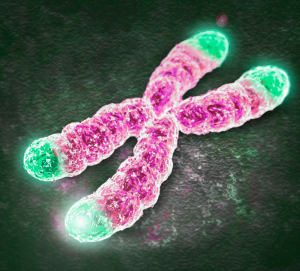 Telomerase is important in that it repairs the telomeres of the chromosomes so that they do not become progressively shorter during successive rounds of chromosome replication. What Can be Done to Reduce Telomere Loss? Firstly smoking cigarettes is known to triple the rate of telomere loss, so if you’re a smoker – stop! The food you eat every day also impacts on how fast telomeres are lost. Consuming fruits, vegetables and other antioxidant-rich foods has been associated with longer, protective telomeres. In contrast, consuming refined grains, fizzy drinks, meat (and fish) and dairy has been linked to shortened telomeres. Dr Dean Ornish and Dr Elizabeth Blackburn found that just three months on a whole-food, plant-based diet, coupled with exercise, could significantly boost telomerase activity — the only intervention that had been shown to do so. Five years later, these same study participants had telomeres that were even longer on average than when they started — suggesting not only that a healthy lifestyle with a focus on the foods active ingredients can boost telomerase enzyme activity, but that it can reverse cellular ageing. The study looked also at quantities of food. If people were eating a typical Western diet, it didn’t appear to matter how small the portions were, how much weight they lost, or how hard they exercised; after a year, they saw no benefit in terms of their telomeres. However individuals on the plant-based diet exercised only half as much, had the same amount of weight loss after three months, and achieved significant telomere protection. This indicates that it wasn’t weight loss or the exercise that reversed cell ageing — it was the food being consumed. This being a whole-food, plant-based diet, that encourages the consumption of unrefined plant foods and discourages meats, dairy products, eggs and processed foods. Studies have shown that when men with prostate cancer went on a half-vegan diet, it appeared to slow down the growth of their cancer. One study found that women who ate more whole plant foods seemed to reduce their chances of getting breast cancer by more than 90%. A large study performed on diet and bladder cancer found that an increase in plant protein of only 2% was associated with a 23% decrease in cancer risk. 1. Cruciferous vegetables such as broccoli, brussels sprouts, cabbage, cauliflower, kale, spring greens, radishes, turnip tops, watercress. 2. Greens including spring greens, kale, young salad greens, sorrel, spinach, swiss chard. 3. Other vegetables: asparagus, beets, bell peppers, carrots, corn, courgettes, garlic, mushrooms, okra, onions, pumpkin, snap peas, squash, sweet potatoes, tomatoes. Two servings a day: a serving is one cup raw leafy vegetables; half a cup raw or cooked non-leafy vegetables; half a cup vegetable juice; a quarter of a cup dried mushrooms. 4. Beans: black beans, cannellini beans, black-eyed peas, butter beans, soyabeans, baked beans, chickpeas, edamame, peas, kidney beans, lentils, miso, pinto beans, split peas, tofu, hummus). Three servings a day: That’s a quarter of a cup of hummus or bean dip; half a cup of cooked beans, split peas, lentils or tofu; or a full cup of fresh peas or sprouted lentils. 5. Berries — any small edible fruit, including grapes, raisins, blackberries, cherries, raspberries and strawberries. One serving a day: a serving is half a cup of fresh or frozen, or a quarter of a cup of dried. 6. Other fruits such as apples, apricots, avocados, bananas, cantaloupe melon, clementines, dates, figs, grapefruit, honeydew melon, kiwi, lemons, limes, lychees, mangos, nectarines, oranges, papaya, passion fruit, peaches, pears, pineapple, plums, pomegranates, prunes, tangerines, watermelon. Three servings a day: One serving is a cup of cut-up fruit, or one medium fruit, or a quarter of a cup of dried fruit a day. 7. Flaxseeds: one tablespoon a day. 8. Nuts: a quarter of a cup a day, or two tablespoons of peanut, almond or other nut butter. 9. Spices — every day you should have a quarter teaspoon of turmeric in addition to any other spices you enjoy. 10. Whole grains (rice, buckwheat, quinoa, cereal, pasta, bread). Three servings a day: That’s half a cup of cooked rice or pasta; one cup of cereal; a slice of bread; half a bagel. 11. Exercise — ideally 90 minutes a day of moderate activity such as walking. 12. Water: five large (340ml) glasses a day. *Dr. Greger is a physician, New York Times bestselling author, and internationally recognised speaker on nutrition, food safety, and public health issues. He runs the popular website NutritionFacts.org.